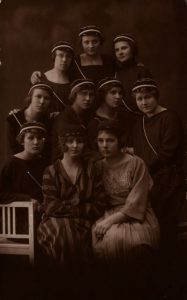 By the year 1923 there were already three student organisations for women in the University of Tartu – two of them being student societies and one a sorority. Nevertheless, ten female students felt the need for a new organisation. 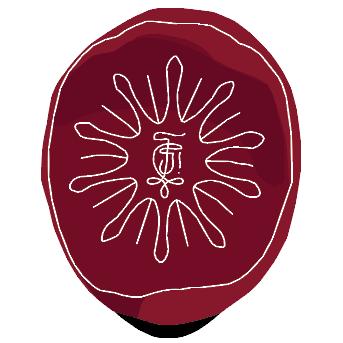 “They had a wish to found a centre which would oppose the governing mentality and unite students with similar views, a centre which would advocate the world view that was considered as essential for an Estonian academic woman.” In these words has vil! Tuuli Keerberg explained the backgrounds of the establishment of korp! Indla. That is why korp! Indla was founded on March 07, 1924. It is quite logical that korp! Indla shared the same general principles with other organisations at the time: patriotism, academicism, and intellectuality were held in high esteem. These three principles were not the only ones; furthermore, other traditional-conservative values such as activeness, dutifulness, honesty, morality, and sobriety were cherished. The sorority was supposed to match two somewhat contrasting roles for an academic woman – professional and family life. The principal idea was to combine all those seemingly controversial concepts as traditionalism and contemporaneity, grandiosity and stability. In other words – to be in our time, ahead of it and independent of it. Although the first sorority Filiae Patriae was above all focused on patriotism, C!I! chose not to follow the same path but stressed the importance of one’s love of home. However, this was not all, through that a lot of importance was attached to our nation. It was believed that one’s homeland starts from one’s family and home. Yet, such values looked alien in that society, they were deemed old-fashioned and outdated. This resulted in a clash between eternal and transient values – one tried to be social while avoiding frivolous behaviour that was regarded as unsuitable for an academic woman. The members of C!I! reckoned teetotalism to be all-important, whereas sobriety did not denote only abstinence from alcoholic drinks but a sober and temperate way of thinking as well. The activities of C!I! were and are above all directed towards its own members. But of course we communicated with other academic organisations as well. 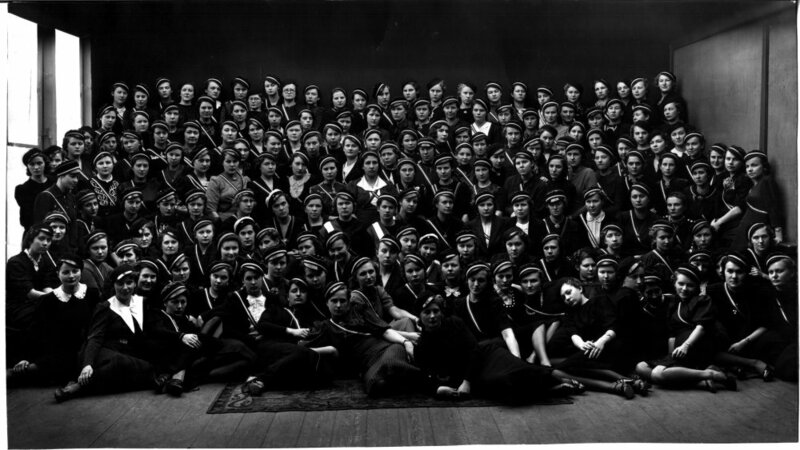 In 1926 we joined a Women’s Academic Home Defence unit; starting from 1930 we took part in the editing-work of the Student Newspaper of the University of Tartu and participated also in the work of the student senate; in 1930 we signed a friendship agreement with Savolainen Osakunta from the University of Helsinki; we also took successfully part in student championships and in the activities of many academic societies. On July 31 1940 the beginning of the Russian occupation in Estonia put a stop to korp! Indla’s activity in Tartu. 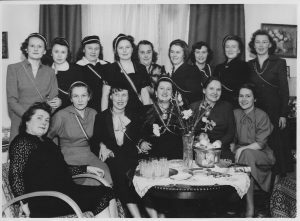 Our members, who had emigrated during World War II, continued activity in exile, establishing convents abroad in countries such as Sweden, the USA, Australia and Canada. They were encouraged to actions by common aims: to preserve Estonian language and culture, to secure their continuance. Although far from homeland, they remained loyal to the principles of korp! Indla both in their thought and actions. The patriotic disposition of the last decades of the previous century resulted in an activities’ boom among students. Student organizations were revived after being prohibited for almost half a century. 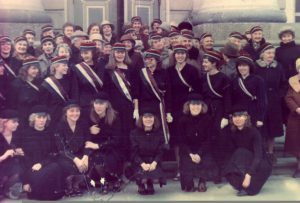 In the fall of 1988 10 female students came to the conclusion that it was time to re-establish korp! Indla. At the end of the year they decided that the official re-establishment would take place in spring 1989, in March just like the establishment in the beginning of the century. On March 31, 1989 our flag was consecrated at a church service at the St. Paul’s church in Tartu, the establishment meeting was held in the main building of the University of Tartu and a small party at the university’s old café. In October 1991 the relationship with our friend organization Savolainen Osakunta was revived. On March 11, 2000 a korp! Indla and korp! Dzintra in Riga entered into a cartel agreement. Noble attitude has always been characteristic of the corporation life, even when emphasising nationalism is not on the first place any more. At present, the most important are the academicism and membership, social communication and symbolic ceremoniality. And the holy mission that everybody understands in his or her own way.